We discovered the Cabaret Cocktail while reading drinks expert Robert Hess, who gives some background on it. As is the case with many cocktails, the origins of the Cabaret are murky. There’s a drink of the same name that hails from the 1920s or 30s (you can find a recipe for it in The Savoy Cocktail Book). But that drink is different from Hess’s (among other things, it calls for caperitif, a South African vermouth-like fortified wine that’s not easy to find in the US). Hess traces his version of the Cabaret Cocktail back to the 1970s, and notes that it may be an older drink. But no one knows who first mixed it. Add all ingredients (except garnish) to a mixing glass half filled with ice. Stir briskly until the contents are well chilled (30 seconds or so). Strain into a cocktail glass, preferably one that has been chilled. Add garnish, if desired, and serve. Which gin and dry vermouth should you use in this drink? Any good name brand would work. Or ask the friendly folks at your local liquor store for suggestions. Bénédictine is an aromatic herbal liqueur that’s a bit on the sweet side. Because of its name, you might think it’s produced by Benedictine monks. In fact, it was invented in 1863 by Alexandre Le Grand, a French industrialist and wine merchant. Le Grand wasn’t one to miss a good marketing opportunity, though, so he falsely claimed that monks at a Benedictine Abbey in Normandy had developed the beverage. Angostura bitters give this drink much of its color. 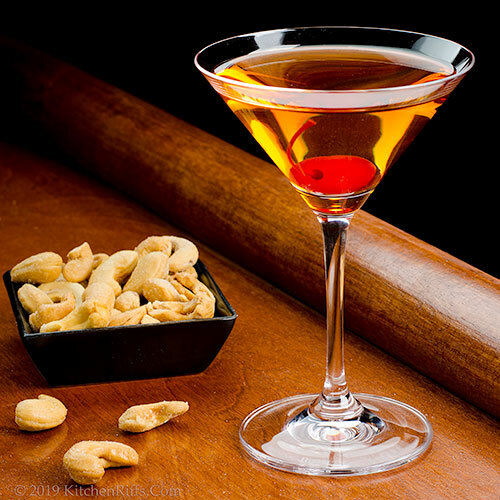 They also blend well with vermouth, forming a nice flavor combo. Don’t skip them. 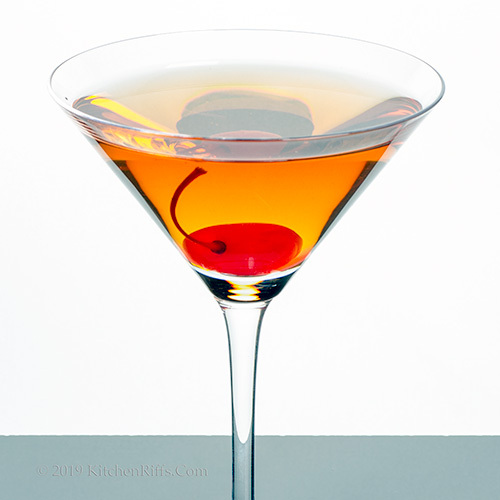 For the garnish, you can use supermarket maraschino cherries (preferably ones with a stem). Better yet, use the Luxardo brand of maraschino cherries if you can find them. Their color is a darker and less garish red than the supermarket kind. Plus they have a much drier, more cherry-like flavor. We’re fresh out of Luxardo cherries, so we used supermarket maraschino cherries for the pictures in this post. Oh yes! Life is a Cabaret Cocktail and it is especially perfect for Valentines Day! Hi Dahn, life -- with this cocktail! -- is good, huh? :-) Thanks for the comment. What a great cocktail for a special day. Will it taste good with chocolate ? Hi Gerlinde, this is better as a before dinner drink than an after dinner drink. Think a martini, with a hint of sweetness. Thanks for the comment. Hi Natalia, and tasty! :-) Thanks for the comment. I would enjoy sipping this lovely drink anytime. Sounds terrific John and beautiful shots. It has to noon somewhere...right? With this terrible mess of sleet and weather advisories might as well hunker down and start our weekend early... Fabulous cocktail! Hi Tricia, this definitely is worth serving anytime, anywhere. :-) Thanks for the comment. Hi Shashi, Mrs KR wants this AND the hearts and flowers. And chocolate. :-) Thanks for the comment. Hi Bobbi, really rainy and gloomy here, too -- cocktail weather! :-) Thanks for the comment. You've now stuck us all with the Cabaret earworm, John! But I'm a sucker for gin cocktails—especially one that sounds this good—so no worries. Hi Terry, there are some great songs in that musical, aren't there? :-) Thanks for the comment. Hi Rocquie, it really is a nice drink for Valentine's Day. Or any day. :-) Thanks for the comment. Beautiful cocktail. Looks perfect for Valentine's Day. Thanks for another great recipe. I love any drink that comes with a maraschino cherry garnish. This sounds great! Hi Lea Ann, really pretty, really tasty. :-) Thanks for the comment. 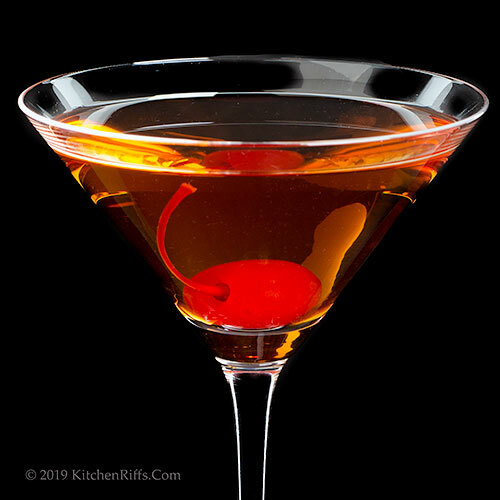 Hi Kelsie, hard to resist a cherry garnish, isn't it? One of the few garnishes that I'll actually eat! Thanks for the comment. The cherry adds just the festive touch for Valentine's Day! Perfect for sipping before dinner. Hi Liz, cherries really are quite festive, aren't they? :-) Thanks for the comment. Hi Merryn, yup, this is a heart winner. :-) Thanks for the comment. What a beautiful cocktail John...and yes, I love gin...indeed perfect for Valentine's Day...super elegant! Thanks for the recipe. That is one fun name. Beautiful cocktail though! Hi Juliana, it really is rather pretty, isn't it? :-) Thanks for the comment. Hi Denise, we love the name. And the flavor of the drink, too! Thanks for the comment. I have to say this sounds very good and would give me a chance to make a dent in our benedictine. I bought it at a liquor store going out of business and didn't know what it was! The weekend can't come fast enough! Hi Abbe, Bénédictine has a nice flavor! And works really well in this drink. :-) Thanks for the comment. This looks so beautiful that I wish I could have a sip too! That is one smooth looking drink. I love drinks with vermouth . . . and cherries. Lovely for Valentine's Day, or really any day. Cheeky intro lol! And love the sound of the cabaret, oh that touch of Bénédictine! Naughty monks. Another fab cocktail. Hi Angie, you need a sip! :-) Thanks for the comment. Hi Valentina, vermouth is SO good with gin -- magical combo. :-) Thanks for the comment. Hi Evelyne, fun stuff, huh? :-) Thanks for the comment. 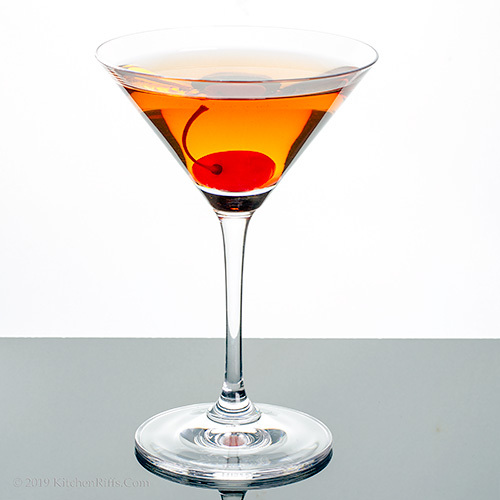 Hi Sherry, we often skip garnishes when we make drinks for ourselves, but hard to resist a maraschino cherry! Thanks for the comment. John, I've never heard of this one, the old version or the newer, but it sounds good. And, of course, your photos of it are superb. Hi Jean, this was a new cocktail to us, too. Glad we learned about it! Thanks for the comment. Sounds like a delicious if potent elixir. I have all the ingredients in my bar, I think I'll give it a go tonight! Hi GiGi, bet Landon will pay attention to Valentine's Day just for an excuse to drink this. :-) Thanks for the comment. Hi Debra, it is, it is! :-) Thanks for the comment. Hi Frank, it's a neat drink -- and you'll enjoy giving it a try! Thanks for the comment. A drink for the heart and spirit! This is the way to begin the evening on Valentine's Day. Hi Deb, yup, it is. :-) Thanks for the comment. Meine Damen und Herren... bitte... make me this Cabaret Cocktail! Hi David, :-) One Cabaret Cocktail coming up, sir! Thanks for the comment. I would rather have a couple of these than flowers for Valentine's day! haha!! Looks delicious! Hi Ashley, Mrs KR wants a couple of these AND the flowers. :-) Thanks for the comment. Hi Ron, we haven't ad Capertif, but your description certainly matches what we've read about it. And in fact we usually shake all drinks (except for photos) because we're barbarians. :-) Thanks for the comment. A drink to make you want to kick up your heels for sure! Cheers to that! I always get a jolt of glee when I see a Luxurado cherry in a drink at a restaurant. I am also a big fan of aperitifs like Benedictine. Hi Carolyn, always fun to kick up one's heels! :-) Thanks for the comment. Hi Laura, those cherries are SO good, aren't they? Need to buy another jar! Thanks for the comment. Hi MJ, I'm sure Bobby would be delighted to make one of these for you! :-) Thanks for the comment. Hi Gingi, just pretend this is juice. :-) Thanks for the comment. Hi Charlie, those "bar" photos are fun to take! :-) Thanks for the comment. Such a pretty drink to serve on Valentine's Day. Who wouldn't be thrilled with something so lovely and sweet! Hi Vicki, I'll drink to that! :-) Thanks for the comment. I was just thinking about how I'd rather have a nice Valentine's cocktail than candy. Perfect timing for this! Hi Lisa, enjoy! :-) Thanks for the comment. This is a lovely Valentine's Day cocktail! Cheers! Hi Amy, it's delish! :-) Thanks for the comment. Hi Anne, photographing stuff with glass is all about light reflections -- read _Light, Science, and Magic_ for a pretty thorough discussion of lighting theory. Thanks for the comment. Hi Emma, it's a beauty, isn't it? :-) Thanks for the comment.